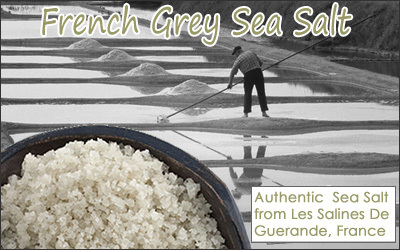 French Grey Sea Salt is formed as the sea water flows into the Guerande marshes, in France, during high tides. The water is directed into a settling pond, where it is evaporated leaving behind a crystallized salt. It is hand-harvested by salt workers, using skills and methods that are over a thousand years old. The salt obtains its natural grey coloring from the salt crystallizing on clay which also provides the salt with its high mineral content that includes magnesium and many other trace minerals. Our grey salt is 100% natural and is imported directly from France. Bathing with Grey Sea Salts helps to re-mineralize the body, maintain balance and promote healthy skin.